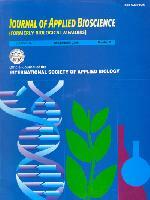 International Society of Applied Biology publishes a biannual multidisciplinary journal, Journal of Applied Bioscience (Former name : Biological Memoirs) catering to various classical and applied aspects of Biological, Medical, Veterinary, Agricultural and Environmental Sciences. The journal publishes articles containing original researches, critical synthesis, revisions and reviews. The wide field purports to enable the specialist researchers to have a closer perspective of disciplines related or even unrelated to his field of interest. The disciplines covered so far include Biochemistry, Genetic Engineering, Biotechnology, Molecular Biology, Veterinary, Tropical and Medical Mycology, Agriculture, Medical, Environmental Biology, Palaeobotany, Paleontology and Morphotaxonomy of plants and animals. NAAS rating in 2017 for this journal is 3.68.